For those of you trying to keep straight the week’s festivities here in NY for the annual Ad Week, yes -- there is an app for that. 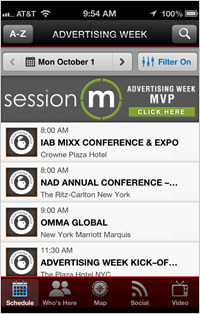 Versions for both iOS and Android can be found at the Advertising Week site. Organizers say they are practicing what they preach in mobilizing the schedule for the dizzying array of events, panels, cocktail parties and entertainment this week. The app has a general rundown of the full slate of partnered and allied events for the week. Rudimentary mapping, indexes of companies involved, and a scant sampling of people highlighted at events are in here too. SessionM, a principal sponsor, has a gamification/check-in element built into the app. You can get points for checking in and viewing videos, etc. that are redeemable for chances to win prizes. I admit that I am not generally a sucker for these gamifications' inherently gimmicky prods to engage me. But I am playing along. Dangle a $200 Amazon gift card in front of this bookaholic and entice him to drill into content that is relevant to his interests anyway, and you have prima facie evidence that gamification can work. Did we say “rudimentary” already? Yeah. We appreciate the effort, but from a mobile app perspective, a few words of advice for next year. An event app really needs more integration. The calendaring function should offer alerts or scheduling into one’s own mobile calendar. The content must be more fully included and indexed so the attendee can search for specific speakers and panels. Without granularity, an app like this can only answer top-line questions. And there are altogether too many pieces at work in here. The Social tab alone has a large list of overlapping methods to be social in the app. The best of them, A “Social Companion,” aggregates tweets, images, and more from multiple sources -- all discussing Ad Week. In fact, aggregation and organization are precisely what an app like this requires. In fairness, it is great that the event has a nod toward mobility by providing an app. But in some respects the Advertising Week app aisle embodies the nascent status of mobile marketing within the larger ad field. Much like the industry, the Ad Week app itself is not clear what it wants to do on this platform: provide a personal organizing function, connect people with one another, promote itself, or just show up on the platform to acknowledge the importance of mobile now and in the future.